The eighteenth annual London Art Fair is on at the Business Design Centre in Islington today and this weekend, showcasing some of the best of Modern British and Contemporary Art. Ninety eight galleries are taking part this year’s fair - the place oozes art. When Londonist had a sneak preview this week, they were still putting the finishing touches to the displays and we half expected to see an artist here and there applying a final top coat. Not to say that there’s anything amateurish about the proceedings, quite the opposite. This is where the big boys and girls of the contemporary/modern art world come to play; Henry Moore, Gillian Ayres and Damien Hirst to name a few. With an emphasis on paintings, you’ll also find sculpture (our pick is David Mach’s "African Matchstick Head" and Richard Ballinger’s “Chalk Line” – a chalk and paper construction with pink pieces of chalk sticking out amongst the white) and other highlights including the painter and filmmaker Jeffrey Blondes’ 52-hour film portraying the twelve-month cycle of a tree (the twelve paintings – one for each month – are shown alongside the film) and the Art Projects Video and Drawing Exhibition – a selection of moving-image work showing how video artists are inspired by drawing. 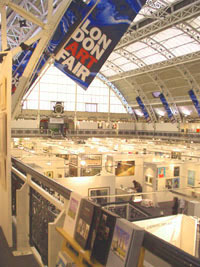 The London Art Fair, Business Design Centre, 52 Upper St, Islington, London N1 0QH. Fri 11.00 - 19.00, Sat 11.00 - 19.00, Sun 11.00 - 17.00. Admission Prices: £10 (£8 concessions) per day in advance (plus 50p booking fee per ticket), £12.50 (£9 concessions) per day on the door.